How Efficient is the 2018 Toyota Prius Prime? Toyota Prius plug-in » How Efficient is the 2018 Toyota Prius Prime? When it comes to fuel efficiency in car models, there’s no model more famous for saving drivers money at the gas stations than the Toyota Prius! The name is synonymous with fuel efficiency, but what some drivers may not know is that that there’s also a Prius plug-in hybrid, the Prius Prime. So, exactly how efficient is the 2018 Toyota Prius Prime? 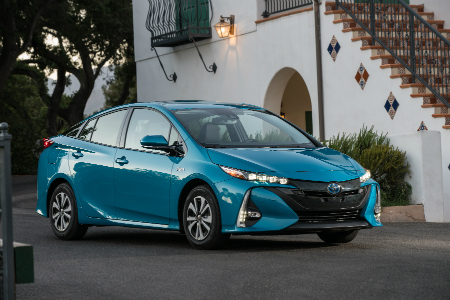 To say that the 2018 Toyota Prius Prime is efficient may be the understatement of the century! With the 2018 Prius Prime in strictly hybrid mode, it gets an incredible EPA-estimated 54 MPG combined fuel economy! That’s impressive on its own. Where it really gets amazing is when you factor in its electric-vehicle capabilities and the EPA-estimated MPGe jumps up to an outstanding 133 MPGe! The Prius Prime has three driving modes so drivers can choose whichever fits their current driving experience, whether that’s EV Mode, EV Auto or HV mode. If you’re new to the plug-in model, don’t worry! The 2018 Prius Prime comes with a charging cable and you can get a full charge at home in less than six hours! Want to learn more about the 2018 Toyota Prius Prime? Ready to get behind the wheel of one? Contact our staff at Hesser Toyota in Janesville, Wisconsin, for more information or to schedule a test drive today! This entry was posted on Wednesday, April 4th, 2018 at 3:11 pm	and is filed under Toyota Prius plug-in. You can follow any responses to this entry through the RSS 2.0 feed. You can skip to the end and leave a response. Pinging is currently not allowed.